The 2016 Federated Auto Parts 400 was a NASCAR Sprint Cup Series stock car race held on September 10, 2016 at Richmond International Raceway in Richmond, Virginia. Contested over 407 laps -- extended from 400 laps due to an overtime finish, on the .75-mile (1.21 km) D-shaped short track. It was the 26th race of the 2016 NASCAR Sprint Cup Series season, and the final race of the regular season before the playoffs. Joe Gibbs Racing's Denny Hamlin won his second career race at his home track from the pole and his third race of the 2016 season. Kyle Larson made his way to a second place finish, the race had seven lead changes among different drivers, as well as a new track record with sixteen cautions for 89 laps, and one red flag for 20 minutes and 23 seconds. 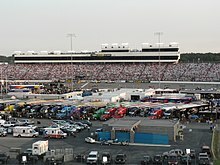 Richmond International Raceway, the track where the race will be held. Richmond International Raceway (RIR) is a 3/4-mile (1.2 km), D-shaped, asphalt race track located just outside Richmond, Virginia in Henrico County. It hosts the NASCAR Sprint Cup Series and Xfinity Series. Known as "America's premier short track", it formerly hosted a NASCAR Camping World Truck Series race, an IndyCar Series race and two USAC sprint car races. The preliminary entry list for the race included 41 cars and was released on September 5, 2016 at 12:07 p.m. Eastern time. Kyle Busch was the fastest in the first practice session with a time of 22.318 and a speed of 120.979 mph (194.697 km/h). Casey Mears was the fastest in the final practice session with a time of 22.396 and a speed of 120.557 mph (194.018 km/h). Denny Hamlin scored the pole for the race with a time of 22.069 and a speed of 122.344 mph (196.894 km/h). Asked why it took so long in the season to get a pole, Hamlin said he had "no idea. We were second and third so many times it was crazy. We were actually looking at the rainouts and were like, ‘We’re going to start seventh because of the rainouts. It hurts our average.’” He also added that Richmond was his "hometown (being from nearby Chesterfield County, Virginia), so I’d probably be a little more aggressive than I would at any other racetrack, but ultimately this race isn’t going to make or break a championship run for us, but it surely would do a whole lot for momentum and feel-good going into the Chase if we could win." Under mostly clear evening Virginia skies, Denny Hamlin led the field to the green flag at 7:47. Ryan Blaney brought out the first caution of the race on lap 10 after suffering a tire blowout and slamming the wall in turn 1. The race restarted on lap 16. The field settled into place and rode around the track. Martin Truex Jr. took the lead from Hamlin on lap 52. The second caution of the race flew on lap 85 for A. J. Allmendinger spinning out in turn 4. Kurt Busch exited pit road with the race lead after missing his pit stall. He came back in and the lead went to Hamlin. During the caution, Greg Biffle got into and turned Tony Stewart on pit road. Jimmie Johnson and Kasey Kahne were sent to the tail end of the field for speeding on pit road. The race restarted on lap 92. The third caution of the race flew on lap 96 for Chase Elliott suffering a tire blowout and slamming the wall on the frontstretch. The race restarted on lap 100. For the next 102 laps, the race ran green. Truex took back the race lead on the restart and held it until Johnson suffered a tire blowout, slammed the turn 1 wall and brought out the fourth caution of the race on lap 202. The race restarted on lap 212. Debris on the frontstretch brought out the fifth caution of the race on lap 223. Brad Keselowski was sent to the tail end of the field for speeding. The race restarted on lap 228. Kurt Busch held the lead for two laps before Truex took it back. Matt Kenseth took the lead from Truex on lap 246 as the sixth caution of the race flew for David Ragan suffering a tire blowout and slamming the wall in turn 1. Regan Smith opted not to pit when the lead lap cars did and assumed the lead, but came down two laps later and handed the lead to Hamlin. Five drivers were sent to the rear for various penalties during the caution: Kevin Harvick and Ragan for speeding, Aric Almirola and Kenseth for a pit box violation, and Brian Scott for too many crew members over the wall. The race restarted on lap 251. The seventh caution of the race flew on lap 266 for Paul Menard rear-ending the wall in turn 2. He went on to finish 40th. Kyle Larson exited pit road with the race lead. Danica Patrick (commitment line violation) and Truex (speeding) were sent to the tail end of the field for pit road infractions. The race restarted on lap 272. Hamlin powered by Larson to retake the lead on lap 273. The eighth caution of the race flew on lap 280 for a single-car wreck involving Casey Mears in turn 3. The race restarted on lap 285. The ninth caution of the race flew on lap 292 after Michael Annett suffered a tire blowout and slammed the wall in turn 2. Larson exited pit road with the race lead. The race restarted with 104 laps to go. Truex worked his way back to the lead with 96 laps to go. The 10th caution of the race flew with 78 laps to go for a single-car wreck in turn 2 involving Carl Edwards. Hamlin exited pit road with the race lead. Ryan Newman (speeding) and Ricky Stenhouse Jr. (pit box violation) were sent to the tail end of the field for pit road infractions. The race restarted with 73 laps to go. The 11th caution of the race flew with 71 laps to go for Allmendinger slamming the wall in turn 1. The race restarted with 56 laps to go. The 13th caution of the race flew with 53 laps to go for Allmendinger wrecking on the fronstretch. The race restarted with 49 laps to go. The 14th caution of the race flew with 45 laps to go for Matt DiBenedetto suffering a tire blowout and slamming the wall in turn 3. The red flag then came out to ensue to facilitate cleanup around the track, After 20 minutes and 23 seconds, the red flag was lifted and the field continued under caution. The race restarted with 31 laps to go. Hamlin was pulling away from the field and had the race all but locked up until Smith suffered a tire blowout, slammed the wall in turn 3 and brought out the 16th caution of the race with two laps to go. The race restarted with two laps to go, six laps past the 400 lap advertised distance, and Hamlin scored the victory while Kurt Busch spun out coming to the overtime line. ^ "2016 Sprint Cup Series schedule" (PDF). Jayski.com. Jayski's Silly Season Site. January 26, 2016. Retrieved September 8, 2016. ^ "Richmond International Raceway". NASCAR.com. NASCAR Media Group, LLC. January 3, 2013. Retrieved September 8, 2016. ^ "Entry List". MRN.com. Motor Racing Network. September 5, 2016. Retrieved September 8, 2016. ^ "First Practice Results". MRN.com. Motor Racing Network. September 9, 2016. Retrieved September 9, 2016. ^ "Final Practice Results". MRN.com. Motor Racing Network. September 9, 2016. Retrieved September 9, 2016. ^ "Qualifying Results". MRN.com. Motor Racing Network. September 9, 2016. Retrieved September 9, 2016. ^ "Federated Auto Parts 400 Results". MRN.com. Motor Racing Network. September 10, 2016. Retrieved September 10, 2016. ^ "Points standings" (PDF). Jayski.com. Jayski's Silly Season Site. September 11, 2016. Retrieved September 11, 2016. ^ "Manufacturer standings" (PDF). Jayski.com. Jayski's Silly Season Site. September 12, 2016. Retrieved September 12, 2016. ^ Paulsen (September 12, 2016). "Ratings Roundup: NASCAR on NBCSN, CFB on ESPN, U.S. Open Semis". SportsMediaWatch.com. Sports Media Watch. Retrieved September 14, 2016. ^ a b Paulsen (September 13, 2016). "NASCAR Richmond Ratings Hit Low Opposite "Battle at Bristol"". SportsMediaWatch.com. Sports Media Watch. Retrieved September 15, 2016. ^ Utter, Jim (September 9, 2016). "Kyle Busch and Toyota lead first Sprint Cup practice at Richmond". Motorsport.com. Richmond, Virginia: Motorsport Network, LLC. Retrieved September 9, 2016. ^ Spencer, Lee (September 9, 2016). "Casey Mears quickest in Richmond final practice". Motorsport.com. Richmond, Virginia: Motorsport Network, LLC. Retrieved September 9, 2016. ^ Kurz Jr., Hank (September 9, 2016). "Hamlin finally wins a pole; all start first at Richmond". Associated Press. Richmond, Virginia: AP Sports. Associated Press. Retrieved September 9, 2016. ^ Pearrell, Tim (September 9, 2016). "Denny Hamlin takes pole for Federated Auto Parts 400 at RIR". Richmond Times-Dispatch. Richmond, Virginia: Berkshire Hathaway. Retrieved September 10, 2016. ^ Horrow, Ellen (September 9, 2016). "Denny Hamlin wins Sprint Cup pole at hometown Richmond track". USA Today. Richmond, Virginia: Gannett Company. Retrieved September 10, 2016. ^ Beard, Brock (September 10, 2016). "CUP: Paul Menard grabs last place away from Ryan Blaney with seven laps to go at Richmond". brock.lastcar.info. LASTCAR.info. Retrieved September 14, 2016. ^ Jensen, Tom (September 11, 2016). "Kenseth, Keselowski rehash bad blood at Richmond". Foxsports.com. Richmond, Virginia: Fox Sports Digital Media. Retrieved September 14, 2016. ^ Gluck, Jeff (September 11, 2016). "Tempers flare as run to Sprint Cup title begins". USA Today. Richmond, Virginia: Gannett Company. Retrieved September 14, 2016. ^ DeGroot, Nick; Spencer, Lee (September 11, 2016). "Newman tears into Stewart: "We all know he has issues"". Motorsport.com. Richmond, Virginia: Motorsport Network, LLC. Retrieved September 14, 2016. ^ White, Tucker (September 11, 2016). "Newman: 'I just got Tony Stewarted'". SpeedwayMedia.com. Richmond, Virginia: USA Today Sports Digital Properties. Retrieved September 14, 2016. ^ Scott, David (September 11, 2016). "NASCAR drivers Tony Stewart, Ryan Newman clash on and off track". The Charlotte Observer. Richmond, Virginia: The McClatchy Company. Retrieved September 14, 2016. ^ Ryan, Nate (September 11, 2016). "Tony Stewart staunchly defends payback measures to Brian Scott, Ryan Newman". NASCARTalk.NBCSports.com. Richmond, Virginia: NBC Sports. Retrieved September 14, 2016. ^ Utter, Jim (September 11, 2016). "Stewart to Newman: 'Don't put yourself in a bad spot with me'". Motorsport.com. Richmond, Virginia: Motorsport Network, LLC. Retrieved September 14, 2016. ^ Fryer, Jenna (September 11, 2016). "Hamlin wins again at Richmond but Newman steals spotlight". Associated Press. Richmond, Virginia: AP Sports. Associated Press. Retrieved September 11, 2016. ^ White, Tucker (September 10, 2016). "Hamlin survives wreckfest regular season finale to win at Richmon". SpeedwayMedia.com. Richmond, Virginia: USA Today Sports Digital Properties. Retrieved September 14, 2016.